Cheap flights to/from Poland with LOT: Warsaw from Prague and other cities for €83! LOT now offers up to 50% discount on all their flights in the recent sale. 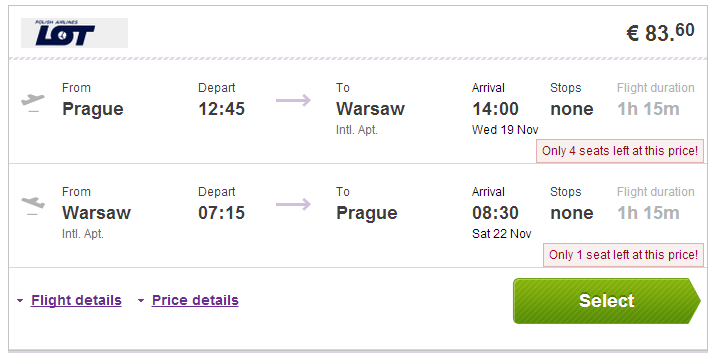 For example return flights from Prague to Warsaw will cost you just €83! This price includes 20 kg luggage and meal onboard. The conditions of this promotion limit departures from November until 12th December and then from 13th January until 22nd March 2015. You have to book your flights before 19th October to get this price. Minimum stay is 3 days, weekend stays are also easily bookable. Here’s list of other destinations on offer. 1 PLN = €0.25. Book on BudgetAir to get these prices in Euros and book in English. Warsaw has wide range of cheap and great value accommodation options, no matter if you look for simple guesthouse or luxurious hotel. The public transport is very efficient so if you find a hotel close to metro or tram stop you will always easily get around. « Cheap flights to Portugal: Lisbon from Berlin for €69!